Can Feminists Love Fashion And Beauty? For one, the amount of energy we apply to beauty and style is a choice, and choice is a central tenet of feminism. Some women choose to go make-up free and that’s all good. If we’re “liberated” why should we not have all the choices available: to use makeup, or not, color or not-color our hair, or wear stylish clothes. We can fight the good fight and still look amazing, if we so chose. 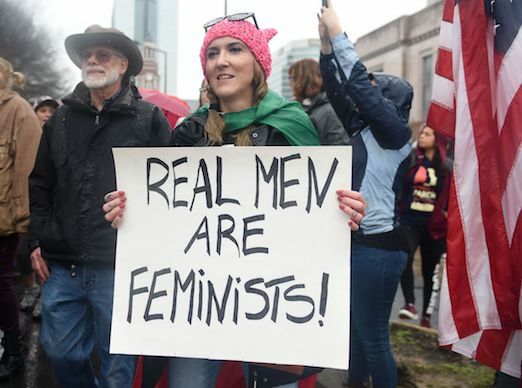 Feminism means equality – of opportunity, education, career choices, managing home life, and of course under the law. I choose to live with both ideas held simultaneously: caring for our outward appearance as well as our inner fire. 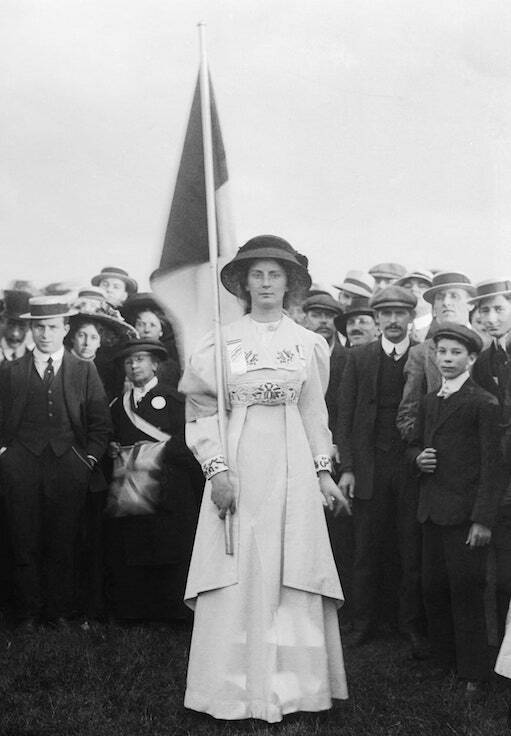 Suffragette Charlotte Marsh in Hyde Park in 1908, wearing a prisoner’s medal and carrying the purple, white and green tricolour flag. CREDIT: MUSEUM OF LONDON. Source. And fashion needs us woke women: we often face the pressure to look a certain way in order to be considered beautiful. Nothing feminist about that. 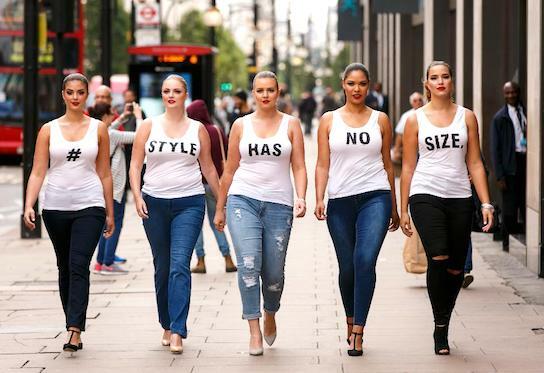 Ideally, fashion would be a celebration of diverse women’s sizes, ages, shapes and ethnicity. But there’s still plenty of size-ism and age-ism in the industry. Young and reed-thin is the aspirational message. That’s not OK. We have to call it out when we see it. “[Fashion] is one of the few industries in which women can actually excel, career-wise. On the other hand . . . the concept of the fashion industry places limitations on beauty and body ideals to society en mass.” Source. This Gucci ad drew a lot of criticism for its ultra-thin models. We’re women, not dress sizes. I’d love to see a silver haired woman here! Equally not-OK is the exploitation of women and children in developing countries to satisfy our cravings for cheap, fast fashion. Promoting ethical sourcing and diversity, shopping second-hand to reduce waste, recycling our clothes – these are some of our tasks as feminists. Finally, a certain by-product of looking after our exteriors is more self-confidence. That’s what helps us to go out in the world and raise our voices, and keep the fires burning. “A confident woman is a force to be reckoned with. A confident woman gets things done. It’s about owning your desires and being in control of how you present yourself to the world.” Source. We love the good men, too. Yes, yes, yes! Thanks for this, Patti! Fashion is a tool, and style is what we make with it. I heartily agree with your nuanced concept of fashion and feminism. I do feel there is a great deal of pressure because of social media that targets insecure women and that can be harmful. However, we women have the opportunity to choose what makes us feel self-confident and comfortable in our own skin. Fashion choices are to be celebrated as the true freedom and artistic expression that it is. Btw, my grandmother was a suffragette. !! Oh, and also, I saw a lot more women of color and women of different sizes on the runway this year. Another bravo. This is spot-on. A lot of “beauty” is about hygiene–clean hair, clear skin…Then it veers off to be all artificial, even though being naturally beautiful is the greatest compliment. And fashion, well, it’s kind of art, but I no longer look just at styles but I also really consider the comfort level. Not in a T-shirt and sweatpants way, but I think that wearing things that are too restrictive, too tight, too painful (heels) makes us look downright silly. For one thing, most men don’t go through that. A guy in a suit can run pretty well if need be, but a woman in heels and a tight skirt? Not that we NEED to run, but sometimes I think that fashion is reducing women to tight little boxes. oh yes, I am saving your last sentence in my journal! thanks for your always-thoughtful comments. I don’t consider myself a feminist. When bras were being burned, I really really needed the support of mine! But I have not shaved my legs or under arms or worn make up in years. I don’t flaunt this. I dress fashionable. And I’m not thin. But seriously I’m too busy for the things society “expects” me to do as a woman. I’ve raised 21 children ages 11 – 42, (17 adopted, 4 by birth, one birth son born when I was 47- now he’s 14) I have 11 at home still! Bravo to you for all the hard and loving work you’ve done!